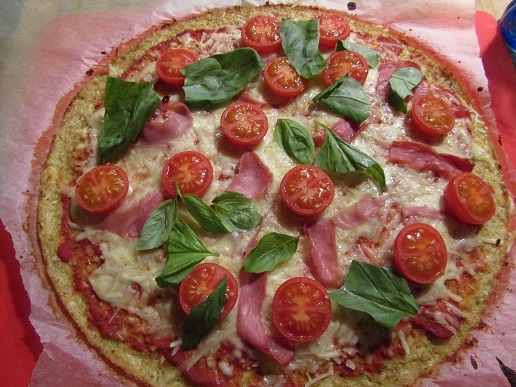 Well this has been a revelation to me, using cauliflower as the crust for a pizza, ok, its not exactly the same as your typical bread dough crust, but when you are on a low carb diet/regime, it is more than acceptable. Hubby asked me if it was more work, really no, there are are a few steps to making the base, however there is also a number of steps to making a bread dough from scratch as I would normally do, so the easy answer is NO. It is filling and serving it with some salad is very satisfying, honest it really is worth a go. Once the base is cooked, then you can add you toppings, pop it back in the oven for the cheese to melt and then its eating time. Take a small to medium cauliflower, remove the leaves and the thick stock from the center. Roughly chop the cauliflower and then place in a food processor and whizz until you have breadcrumb size. If you don’t have a food processer then you can use a grater, it does the same job. Once you have breadcrumbs, place them into a bowl and place a lid on or plastic wrap and place into the microwave for 4 minutes, when the time is up, remove and give the mixture a stir then place back into the microwave for another 3-4 minutes, remove and leave on the side for another 5 minutes, this will help to steam the cauliflower. Once it is cooked, tip the crumbs out onto a clean tea towel and allow to cool until it is cool enough to handle, you need to squeeze out the water, get as much water out as possible, it will help with dough. When you have removed the water, then place the cauliflower back into the bowl add the eggs and seasoning and mix well together. Place a sheet of greaseproof paper onto a backing tray, and press the cauliflower mixture out to the size you want. Make sure it is nice and compact so that it forms a crust in the oven. Bake for 20 minutes in a very high oven, and then remove and add your toppings, first the crushed tomatoes, then the cheese, little bits of ham and then the cherry tomatoes. Of course you can use which ever toppings you like. 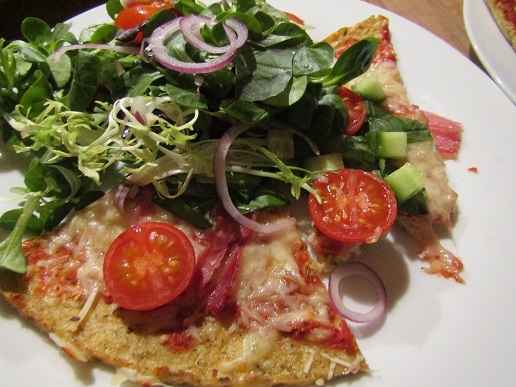 Then it was back in the oven for 10-15 minutes until the cheese was bubbly and melted and then it was cut into slices and served with some salad leaves. 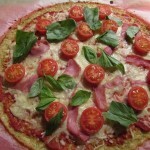 Low Carb cauliflower crust pizza, add your toppings and delicious meal. Heat the oven on 240c/220 fan/Gas 9. Remove the leaves and center stock from the cauliflower and chop then blitz in a food processor until you have bread crumbs. Place the cauliflower into a bowl with a lid (or plastic wrap) and place in the microwave for 4 minutes, Remove and give it a stir then place back in the microwave for another 4 minutes. Remove from the microwave and leave the lid on for about 5 minutes, to complete the cooking/steaming process. When ready, tip the contents of the bowl out onto a clean tea towel and leave to cool until you can handle the cauliflower, you need to squeeze out as much water as possible. Place the dry cauliflower back into the bowl and add the eggs and seasoning and mix through. Place a sheet of greaseproof paper onto a baking tray, I used a pizza tray for the shape, then tip the contents of the bowl out and press the mixture on the try, make sure it is nice and compact. Place in the oven and cook for 20 minutes, this should be enough time to create a crust on the bottom of the cauliflower. Tip the crushed tomatoes into a bowl and add the herbs, mix through. Remove the cooked crust from the oven and add the toppings, first the tomatoes then the cheese, ham and sliced cherry tomatoes. Place the pizza back into the oven and bake until the cheese is melted. This should be about 10-15 minutes. Remove from the oven and slice, and set on a plate with your green salad. Add any herbs and spices to the crust, it is softer than a typical bread dough, however it can be lifted like a slice of pizza and is delicious. We did not miss the bread dough.